Pioneers in the industry, we offer sandstone balustrade, stone lamp post, sandstone column, sandstone pillar, stone baluster and carved stone pillar from India. We are one of the prominent designers, manufactures and exporters of some premium quality Sandstone Balustrade. 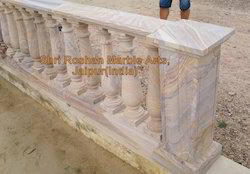 These Sandstone Balustrades are carved to perfection and are totally customised as per the user in their dimensions. Beside this we manufacture all type of stone & Marble articles including Marble Jali, Stone Jali, Planters, Marble carvings, Stone carvings, sculptures etc. Open our catalogue to see our products. 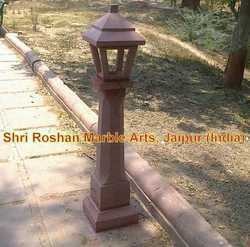 With rich industry experience, we are offering a wide assortment of Stone Lamp Post. The given lamp post is crafted from the top grade stone & contemporary tools as per the set trends of market. Offered lamp post is accessible in a number of sizes, finishes and customized options so as to fulfill the needs of customers. This lamp post is checked in terms of quality for ensuring its flawlessness. Accredited for the noteworthy contribution in the market, we offer an extensive range of Sandstone Column. 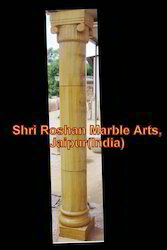 The given sandstone column is crafted from the top grade marble & contemporary tools as per the set trends of market. Offered sandstone column is accessible in a number of sizes, finishes and customized options so as to fulfill the needs of customers. This sandstone column is checked in terms of quality for ensuring its flawlessness. Our team has workers with over 35 years of experience working in the stone industry, this is reflect in the picture of the Sandstone Pillar. 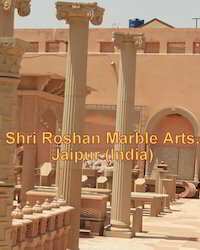 Basic and elegant design Sandstone Pillar made to perfection from pink sandstone. We offer 100% customization in design and size to our clients. 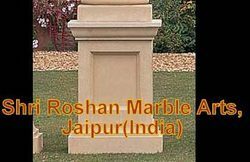 Beside this Sandstone pillar we are one of the leading manufacturer and exporter of various others marble & stone articles like Stone Planter, marble Jali, stone fence, marble panel and much more. Stone Baluster are one of the commonly used structures in houses and temples & our company offers some superb artistic designs along with some simple too. These stone balusters adds a different dimension to house railing structure & thus become an eye catchy art. Perfectly carved from single piece using Lathe machines and hence assures that the balusters will be perfect round. 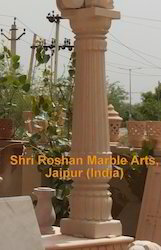 Shri Roshan Marble Arts & Handicrafts, a well known manufacturers and exporters of all type of marble & stone products, example this Carved Stone Pillar. Made from a single piece sandstone with a heritage look, this Carved Stone Pillar is simply a masterpiece of art. This Stone Pedestal is made from Natural Sandstone with a basic yet modern design. Stone Pedestal look very beautiful and stylish when kept in a room or garden or in the lobbies, becomes the centre of attraction for everyone. We offer 100% customization of these Stone Pedestals according to user defined size, shape and designs. Beside this our team deals in all kind of marble & Stone related stuff like the Stone Fireplace mantel, Marble Fireplace, Stone Planters, Marble Jali, Stone carvings and a whole lot of stuff. Packaging Details: Wooden crate with foam. Looking for Sandstone Pillars ?